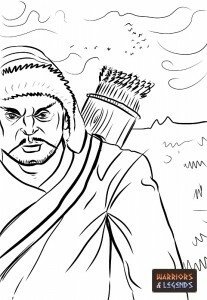 The Mongol warriors clothings was designed to work in many environments, cold and warm, sunny and dark. In the early Mongol years before the empire had grown and the Mongolians were just a small tribe, most clothing was made of hemp fibre material, and animal skin. Later when the empire grew, and the Mongols travelled their clothing materials broadened. From lands like China they discovered silk, which would become a favourite material providing a smooth alternative to the rough hemp for the Mongols. From India they discovered cotton which came to replace many of their traditional hemp clothing, due to its more mailable form and overall lighter weight. One interesting story about the Mongol warrior clothing was that of them not washing it. Apparently it was seen as a weakness should a warrior wash their clothing, and there are even stories of warriors being beaten by their comrades for even thinking to wash them. Trousers were used by the Mongol warriors as an everyday piece of clothing and would be tucked into their boots. The trousers would keep them legs warm in the harsh cold, and the baggy design would help keep them cool in heat, essential for a warrior who could end up in the cold lands of north east Europe or the warm points in south Asia. The flexible deel was lightweight or heavyweight, a cool overcoat, or a heavy winter coat. Materials used to produce the deel were often dictated by the wealth and status of the wearer, deels could be made from wool, silk or basic cotton. A Mongol warrior wearing the typical Mongol deel. Hats were an essential piece of clothing for every warrior. Worn in all conditions and seasons, this hat was made from animal skin and trimmed with fur. The Mongol warrior hat would also have flaps on the side, allowing the hat to be worn up in the summer, and in the harsh cold winters down to keep the ears, neck and side of the warriors face warm. The Mongol warriors would experience extremes of weather depending on what part of the empire they were located, but footwear was always essential. Boots were very common for Mongol warriors, with many reports of boots being made to be wearable on any foot. These boots would be fashioned from animal hide, often from cow skin, goat or sheep, with the sole being layered numerous times to bear the changing climate. The toe of the boot would curve upwards to make using stirrups easier, as horse riding was an essential part of life for all Mongol warriors. Suited perfectly for their environment, the Mongols had a unique style of dress accommodating their nomadic nature and the changes in climate they would face. Of course among the travels and the growing Mongol empire, they were not afraid to pick up some additions on they way also.